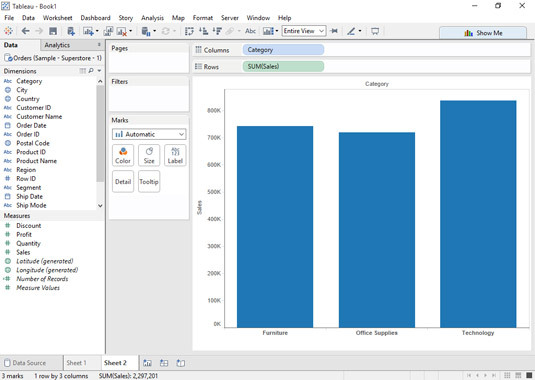 The Rows shelf works exactly like the Columns shelf in Tableau except that the directions of the bars are swapped. In virtually every case, you’ll actually use both of the shelves in creating a visualization. For example, this is a common vertical bar chart with a dimension added to the Columns shelf and a measure added to the Rows shelf. In most cases, you’ll use both the Columns and Rows shelves. Swapping the locations of the dimensions and measures (or clicking the Swap button on the toolbar) changes the direction of the bars, but otherwise doesn’t affect your analysis. Sometimes when you make certain changes in Tableau, it does something that can seem a bit mysterious. For example, this is what happens when the Profit measure is dragged onto the Sales axis in the chart. It substitutes fields named Measure Names and Measure Values. What’s up with that? 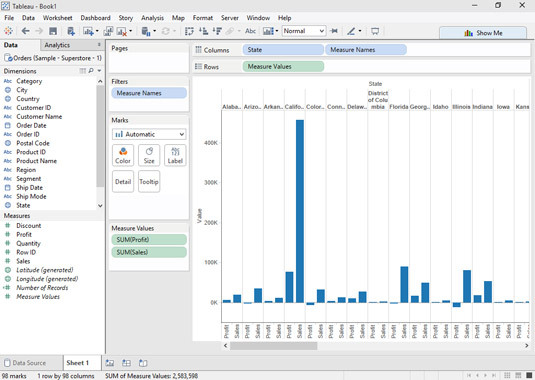 Tableau has its own generated fields that sometimes appear to help display multiple measures. Measure Names and Measure Values fields are added to your visualization when you attempt to add more than one measure to the same axis. Sometimes you might do this on purpose, and sometimes you might do it quite by accident.